Armenia /ɑrˈmiːniə/ (help•info) (Armenian: Հայաստան, transliterated : Hayastan, IPA: [hɑjɑsˈtɑn]), officially the Republic of Armenia (Հայաստանի Հանրապետություն, Hayastani Hanrapetut’yun, [hɑjɑstɑˈni hɑnɾɑpɛtuˈtʰjun]), is a landlocked mountainous country in the Caucasus region of Eurasia. 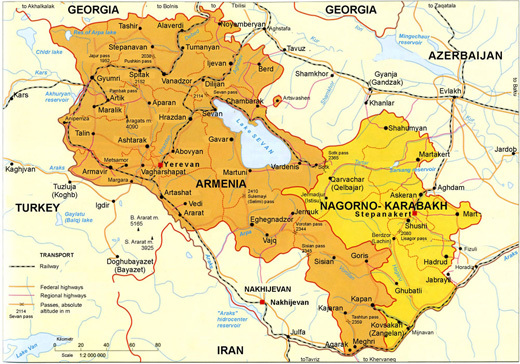 Situated at the juncture of Western Asia and Eastern Europe, it is bordered by Turkey to the west, Georgia to the north, the de facto independent Nagorno-Karabakh Republic and Azerbaijan to the east, and Iran and the Azerbaijani exclave of Nakhchivan to the south. A former republic of the Soviet Union, Armenia is a unitary, multiparty, democratic nation-state with an ancient and historic cultural heritage. The Kingdom of Armenia was the first state to adopt Christianity as its religion in the early years of the 4th century (the traditional date is 301). The modern Republic of Armenia recognizes the Armenian Apostolic Church as the national church of Armenia, although the republic has separation of church and state. Armenia is a member of more than 40 international organisations, including the United Nations, the Council of Europe, the Asian Development Bank, the Commonwealth of Independent States, the World Trade Organization, World Customs Organization, the Organization of the Black Sea Economic Cooperation, and La Francophonie. It is a member of the CSTO military alliance, and also participates in NATO’s Partnership for Peace (PfP) programme. In 2004 its forces joined KFOR, a NATO-led international force in Kosovo. It is also an observer member of the Eurasian Economic Community and the Non-Aligned Movement. The country is an emerging democracy.